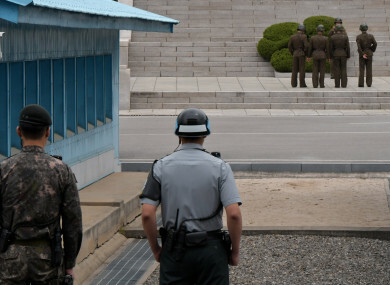 South Korean soldiers stand watching the North side at the joint security area (JSA) of Panmunjom in the demilitarised zone. A NORTH KOREAN soldier escaped to the South today across the heavily-guarded Demilitarised Zone that divides the peninsula, triggering gunfire on both sides of the tense border, in the second defection in successive months. The “low-ranking” soldier was spotted by South Korean soldiers using surveillance equipment as he crossed the midwestern part of the land border in thick fog and made his way to a guard post, a spokesman for Seoul’s defence ministry said. There were no shots at the time, he said, but about 90 minutes later South Korean troops fired around 20 rounds from a K-3 machine gun to warn off Northern guards who approached the border apparently looking for their comrade. Away from Panmunjom, the rest of the 4-kilometre-wide DMZ bristles with barbed wire and is littered with minefields, making any crossing extremely hazardous. Thursday’s defection was the fourth by a soldier across the DMZ this year. The developments bring this year’s total for the number of people defecting directly to the South to 15, a Joint Chiefs of Staff tally showed – three times as many as in 2016. Around 30,000 North Koreans have fled repression and poverty in their homeland to reach the South over the decades since the end of the 1950-53 Korean War, with 1,418 doing so last year according to Unification Ministry data. The vast majority go first to China, with which the North shares a long border, and where they face the risk of being repatriated to an uncertain fate if caught. They travel on to the South later, usually via another country. Email “North Korean soldier defects to South, triggers gunfire at border ”. Feedback on “North Korean soldier defects to South, triggers gunfire at border ”.